New Years celebrations will be held everywhere tomorrow night and what better way to decorate for the holiday than with glitter, glam & stars. 3D constellation stars hung from fishing line would make a dramatic focal point. Gluing down glittered stars on the floor (depending on the type of surface you have) or on the table in leu of a runner or on even on the wall in replace of a banner. I love clear plates and most Dollar Trees have them along with wine glasses…..for $1. Very cost efficient if you’re on a budget. I really believe for the most part, desserts should stay along the lines of the color scheme of a party. These above would work well. Let’s say you’re a true hostess who loves giving out favors your guest can have a token of your appreciation for attending, then these boxes would work perfectly. 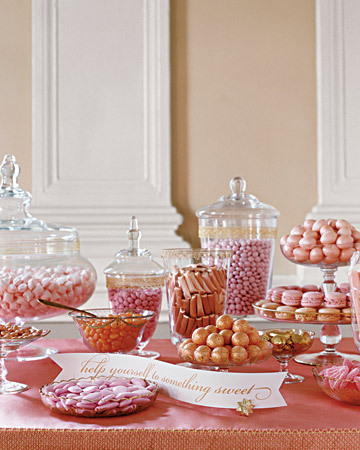 Again with any dessert or candy buffet, various sized jars work the best in creating an interesting tablescape. Stick with the same color scheme to keep it cohesive. Need more candy buffet inspirations…click HERE. Not sure what kind of desserts to serve? How about a cheesecake bar. Now I’m always thinking of ways to get your grub on in a fun way and I’ve thought of the Smores Bar & I’ve done an ice cream social twice (make your own sundaes) but a cheesecake bar never crossed my mind. Head on over to the High Heeled Hostess to get inspired. Now I have a taste for some. What is on the menu for your festivities? LOVE the star table runner idea! Very creative! Thanks for linking me 🙂 Have a great New Year!